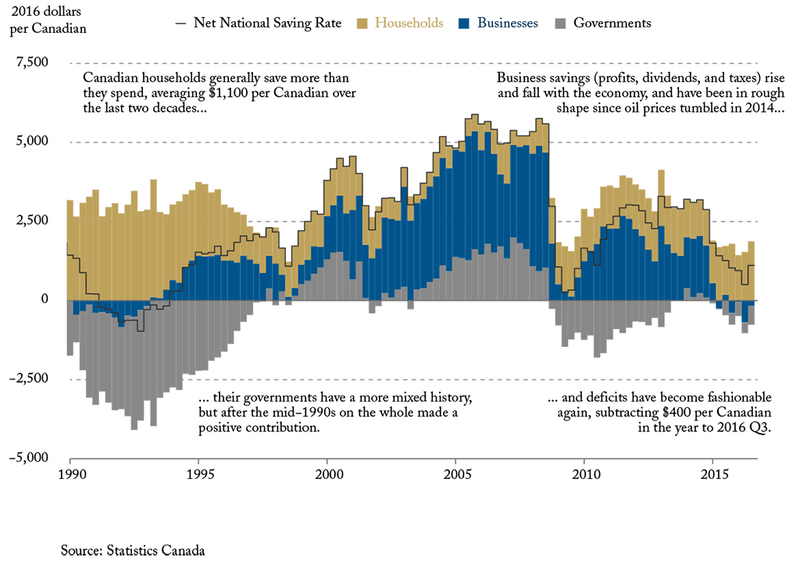 In this edition of Graphic Intelligence, we profile the history of what the three main sectors of the Canadian economy – households, businesses, and governments – have saved of the national income over time, adjusting the historical data into 2016 dollars per Canadian. These three components, positive when a given sector is saving and negative when it is borrowing, comprise most of the National savings rate (shown as the black line). In the most recent year, Canadian households saved almost $1,700 per person. But losses by businesses and the recent deficits run by Canadian governments reduced this rate to only $900 per person, far below the average since the mid-1990s. Given the important reliance of future prosperity on current saving and economic growth, Canadians should be asking themselves whether these deficits are worth it in the long run. To read more about why saving needs to be a national priority, read “Enduring Virtues: Saving and Investing as National Priorities for Canada in 2017” by Institute President and CEO, William B.P. Robson.